With the scope of Sibos forever expanding, both in terms of participant-types and range of themes covered in the conference sessions, it is a growing challenge to encapsulate its key takeaways in a single publication. 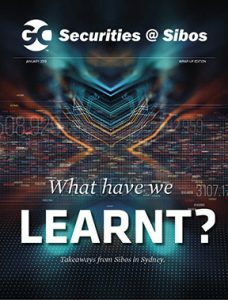 For a magazine focusing primarily on securities and related technologies and regulations, the task is complicated by the nature of the coverage afforded to the securities industry at Sibos. Once a discrete segment of the programme, lines have now blurred. While securities per se may be less prominent, numerous sessions are of interest to players in the securities market ecosystem. In this wrap-up edition, we have therefore opted for a mix of reportage from the conference itself with consideration of some of the prominent themes from the event. The latter include the question of how to make best practical use of the data that resides within post-trade service providers and the likely impact of distributed ledger technology on post-trade functions. The coverage is framed by a thought piece from Thomas Zeeb, head of securities and exchanges at SIX, about the future of stock exchanges. This is particularly pertinent since SIX Digital Exchange is set for launch in the next few months. We hope you enjoy reading this edition by clicking here, and look forward to seeing you at Sibos in London in September.